…or how granola brought back a dream! I thoroughly have enjoyed these daily routines with the animals. The waking up and beginning of the day is really a different interaction then the quiet night time closing up of things, and both feel like a pretty nice way to begin and finish a day. We have had a lot of rain recently and this week that I have been holding down the fort has been super rainy. 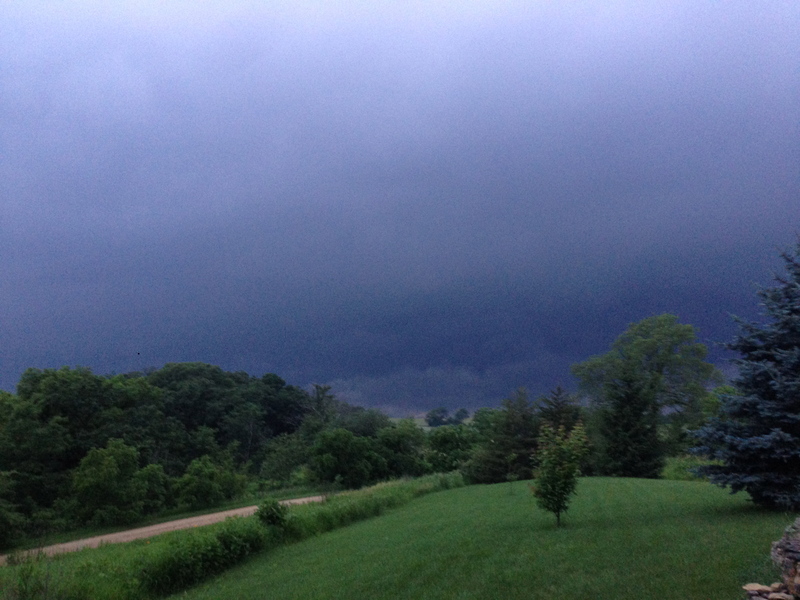 This picture was actually the night before hubby left for the west coast, it was a very dramatic looking sky which ironically resulted in no rain, this storm went north. 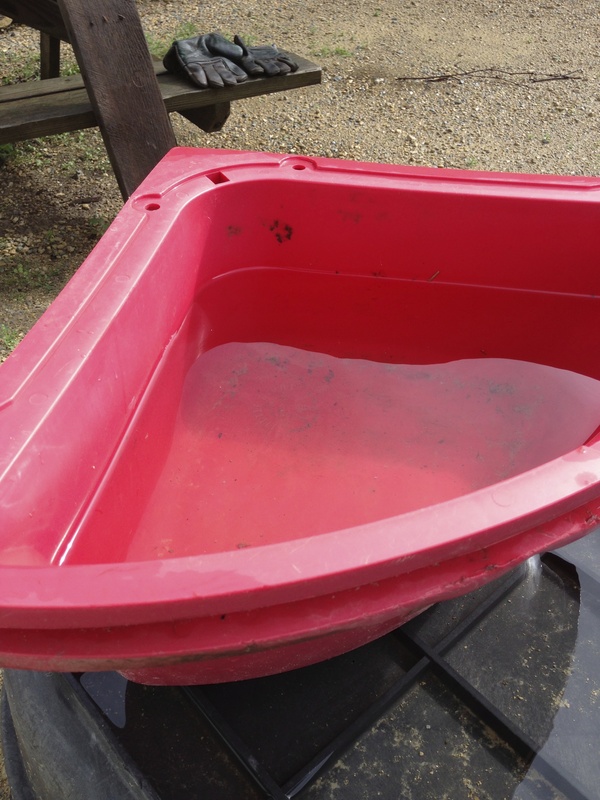 This old horse corner feeder, has become a default rain gauge. Seems that rain gauges always have an expiration date, always falling apart sooner than later. 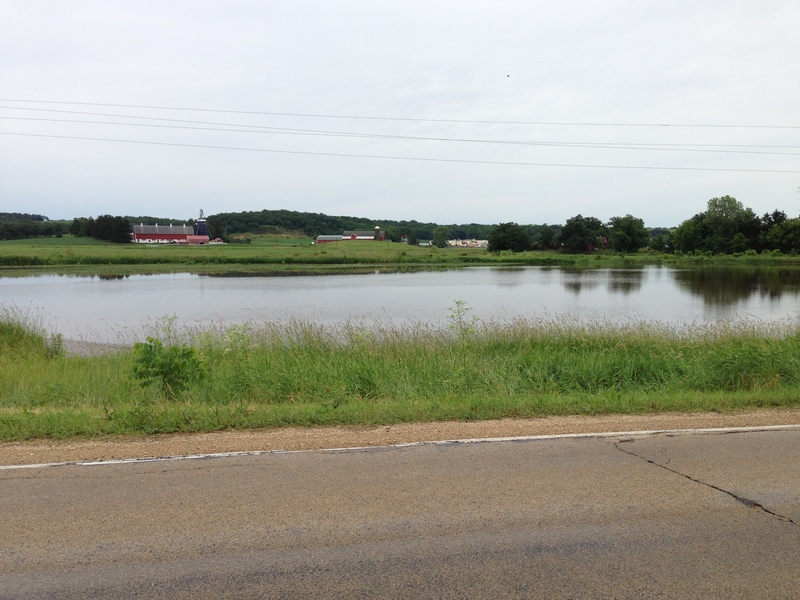 The rain in here was a day and half’s worth of rain and probably about 4-5 inches..
On the way to town I passed this planted farm field, which appears to be a lake. This was what it looked like as I got into town. 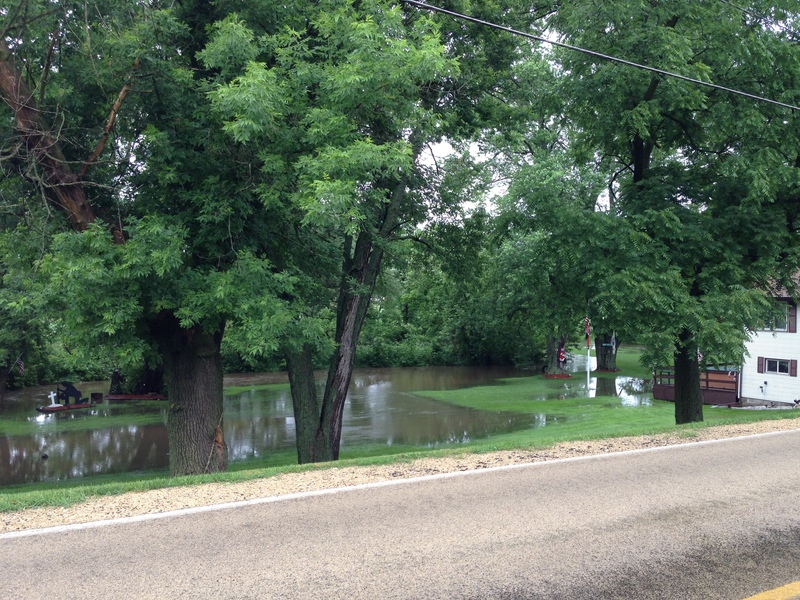 There were actually other towns not far from here that had considerably more rain, with one community getting 13.2 inches! Most homes there sustained some degree of damage. It’s been tough for a lot of people, I feel very grateful we live on a hillside. That hubby is a good planner. I have teased him that he should have been a risk assessor, however, I also find out that routinely his very critical thinking leaves us in a good place. I’m always learning things from him, sometimes when he doesn’t know it at all. So I am trying to fine tune a system of how to best handle kitchen scraps and waste. In the past vegetable scraps, egg shells, coffee grounds, embarrassingly all went in the trash. Hubby had a remote site for dumping some compostable waste such as bad hay etc., however, I never really made friends with a system for compost. If I had a whole lot of a certain thing such as, the peelings from 25 pounds of potatoes at Thanksgiving, he would take it out for me. Now that I am looking at everything from a different set of eyes garbage has become a science. Ends of vegetables and peelings all go in a bag in the freezer. They eventually will make a vegetable broth. Then the spent ends and pieces that made the broth become pig food once cooled. Egg shells would be something that would go in compost although the pigs eat them and if washed, dried and crushed they are good for the chickens, it provides them more calcium. I do want to look into what our local grocery store is wasting as well. An example would be, where is that organic milk going when it expires? Is it thrown away? The pigs would be happy to slurp it up with great speed. There is always vegetable waste at a grocery store too, and quality bakeries that have bread waste would be a good place to start looking too. I never thought much about garbage, and now I find myself thinking about it on many levels. We are preparing for a different kind of week. Hubby is off to the west coast to visit with family for a week, and I will be taking care of things here. After what turned out to be a long granola baking day today, I will put in one more day tomorrow. This way I will have my baking done for the week and will have time to do things on the farm for the majority of the week. 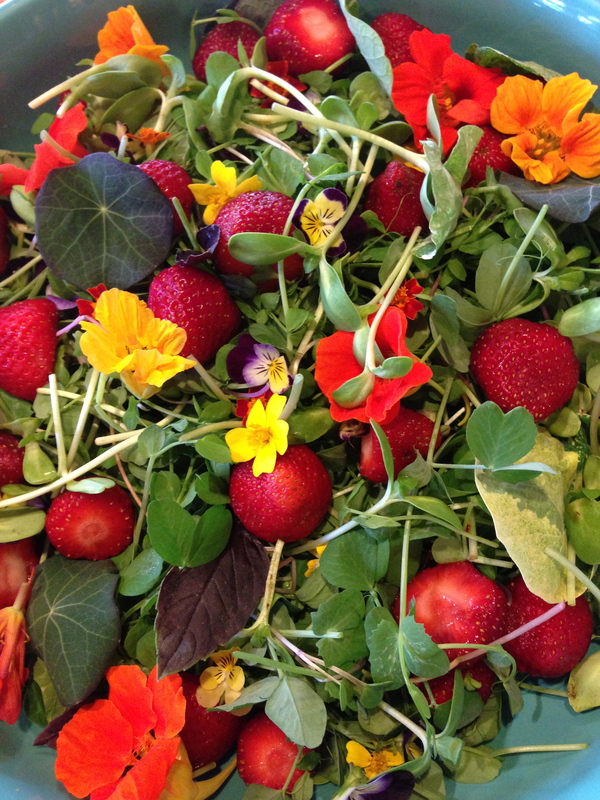 The gardens need weeding, there are veggies to blanch and freeze, the cherry tree is about to pop with red cherries, the black cap berries look like by the end of the week they will begin turning purple and the animals need feeding and cleaning up after. I’m looking forward to it all, as well as some down time to do some reading. I’m hoping I even throw a line in fishing at a very near by trout stream. We had a very big day here yesterday. 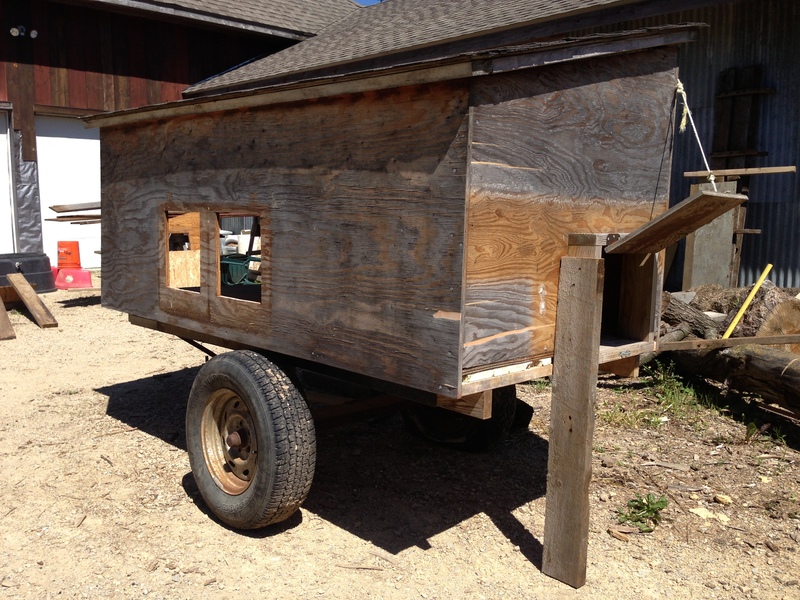 The chickens have left the brooder and are now finally in their coop and yard. They were very confused by the transition and mostly cowered in the corner of the coop. We finally gently pushed them out into the yard and they curiously began exploring. 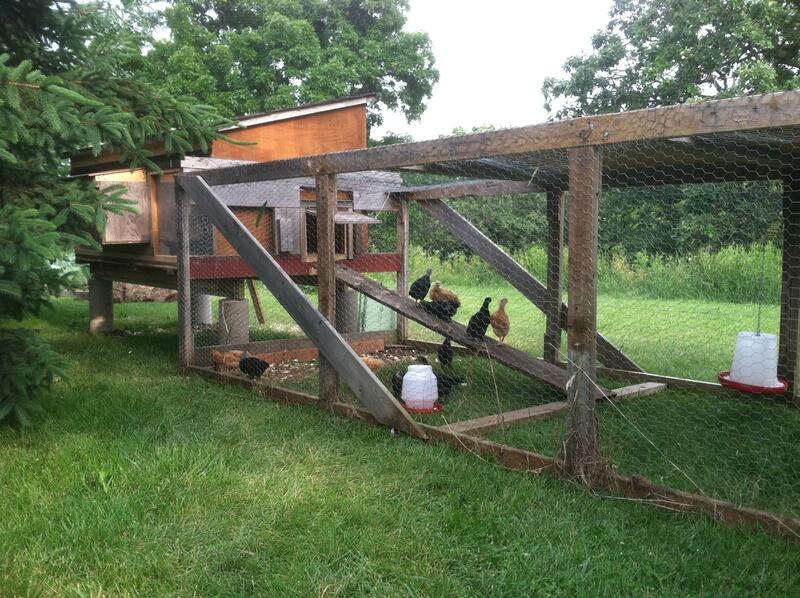 So nice to see them pecking around in green grass, and out of the watering tank/brooder in the garage! Good neighbors, good food, good time. I am happy to say that I have too much Kale, Collards and Chard to eat, which is totally what I hoped for when I planted. In addition to eating these yummy veggies, I am blanching and freezing them in portions for two. When Fall and Winter come, I will be happily turning to the freezer instead of the organic produce aisle at the store to buy some very expensive, well traveled produce, from California, Mexico or even farther! I am hoping to fill the freezer with all kinds of green vegetables, homegrown greens will be a real treat come January! At this point I am moving my attention from Asparagus, and Rhubarb to green beans, although the season has only just started they are plentiful. I have beans here and we will eat and enjoy those fresh, but I don’t have enough for processing and since we love Spicy Dilly Beans and I want to have enough frozen till next year’s beans begin to produce, I got started early. The call came! I’ve been waiting for word on Strawberries, and I got it the other day. 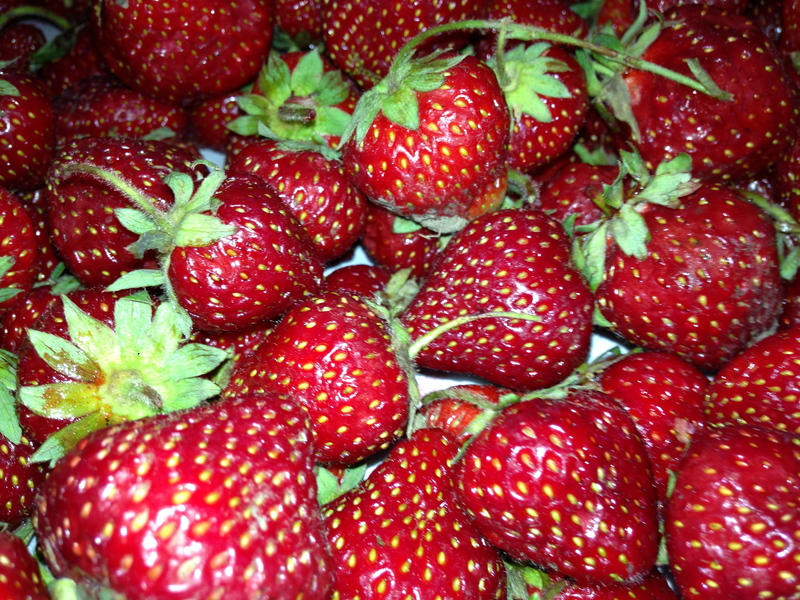 My wonderful organic farmer neighbors next door, have connections to all kinds of seasonal goodies and now I have enough strawberry jam, rhubarb-strawberry jam, and frozen strawberries for the year. The pigs are loving all my produce scraps and pretty much inhaled the strawberry tops and green bean ends! 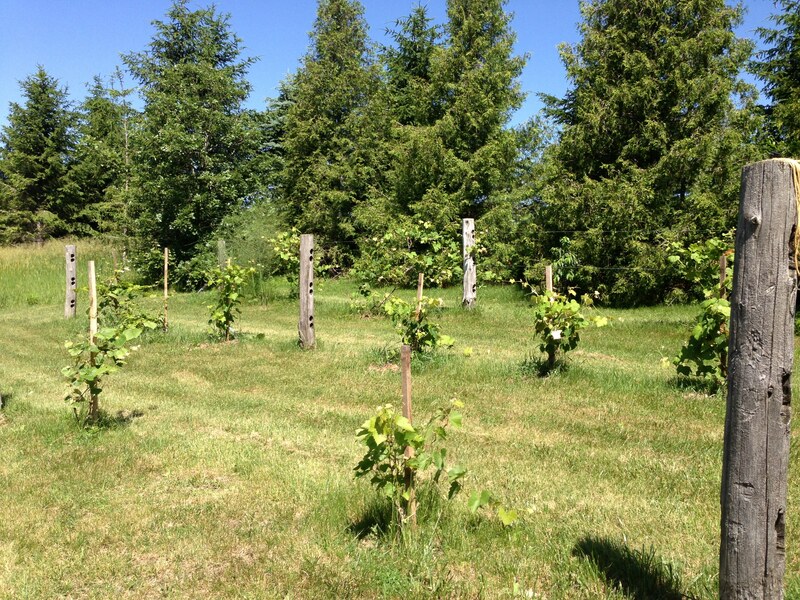 Our very young “vineyard” as we laughingly call it, is coming along nicely. Hubby is ready to increase the grapes in a large way next year. He already talked to a winery in town and they are always interested in local grapes. It’s important to me that in the midst of getting this done and that done that I am aware of the present and not just planning for the next to do item. I thought this was a worthy stop on my way to the next thing.. 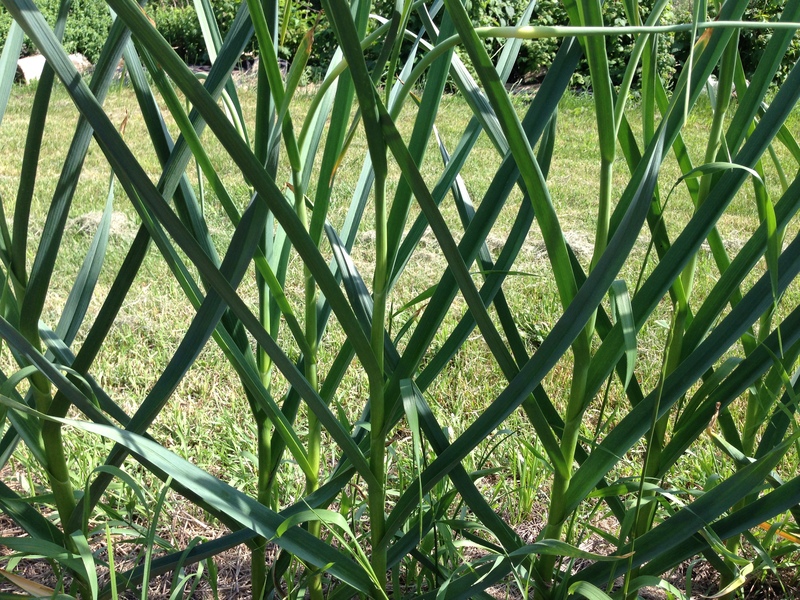 The Garlic has provided us with a green lattice, which looks so pretty in the garden! 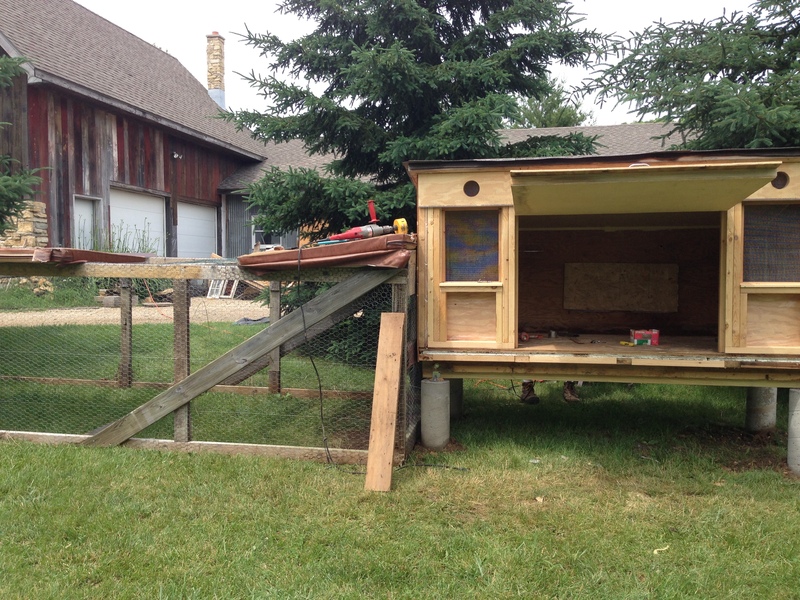 And here is the almost ready coop shown below. They will be in their new home very soon! The pigs are also growing fast, and eating voraciously, but mostly right now they are hiding in their shed trying to get away from the baking sun and hot temperatures. They are relishing in all the garden scraps. It is nice to know that all pieces of food grown here will get used. If it isn’t for us to eat, then it is for them. Everyone gets fed and then anything else goes into the compost for better garden soil next year! Each bit of food has a purpose. 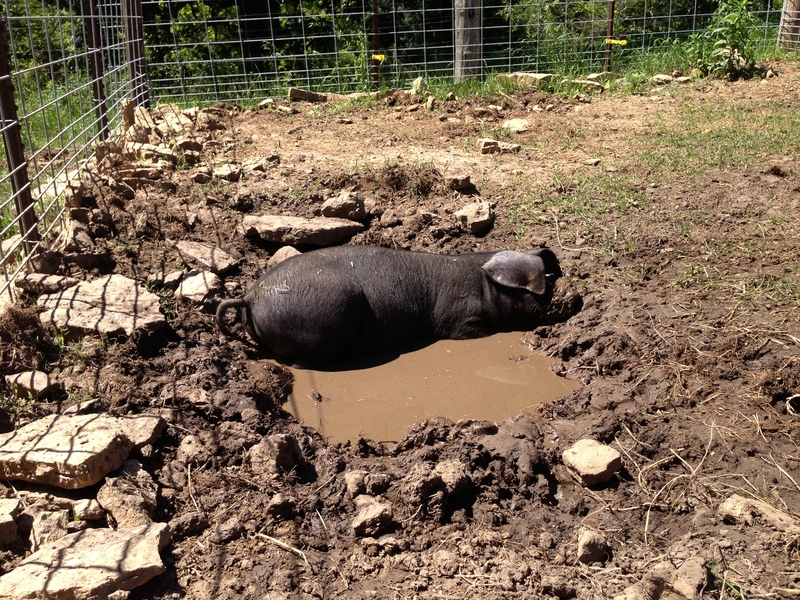 This is definitely wallowing weather! The forecast is threatening 100 degree heat indexes, which somehow makes the long cold winter we had seem light years away. In other animal news, the cattle are getting ready for big happenings, as the weekend of the July 4th young Joey Meatball will get banded and very soon the girls will be bred. There is lots of learning going on here to understand the cycle, the signs and the implications of each. I love the learning and watching their behavior is so helpful to understanding how they respond to situations and people. Spring on the farm is a busy time!